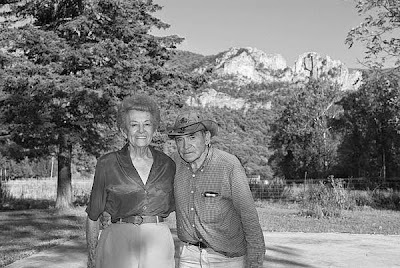 It all started in 1935 when Seneca Rocks resident, Carl Yokum, realized the potential of the area as a premier fishing tourism destination. That year, he built the first two log cabins at an investment of about $30 per cabin that would grow into the massive vacation empire known as Yokum's Vacationland. Three years later, Carl married his childhood sweetheart, Shirley Bland, and together they ran their rustic empire, which today includes a general store/motel, Princess Snowbird's Indian Village complete with teepee camping, campsites and cabins, a restaurant, a second motel, two school buildings and even more log cabins! However, things didn't always go as planned for the Yokum's and their campsite near the base of Seneca Rocks. Carl's very first customers only paid for one week---their second week's check BOUNCED. During WWII, Seneca Rocks was used as a rock climbing training facility for soldiers, and tourists were replaced with military personnel. Vandals destroyed the original canvas coverings of the teepee village and in 1985, deadly flooding destroyed most of the original cabins. But through it all, the Yokum's managed to stay together, and rebuild, bigger and better than ever at each setback. Today, Carl has passed, but Shirley still takes care of much of the daily operations well into her 90s and visitors still come from miles around to stay at the campground. Staff working as guides to Seneca Rock also sometimes stay for the season. In fact, it is one such former employee who is responsible for sharing all the spooky goings-on here! In February of 2014, a climbing guide who stayed at the campground in a pop-up camper all season long wrote into the WVGhosts website to share plenty of personal stories from the campground. Activity experienced included a constant feeling of being watched, either through the windows of the camper, or from the treeline or pavilion on the way to the bathhouse from there. The pavilion was also said to creak and make other noises, just as if someone was standing there. Footsteps were heard in the gravel behind this guide, and in one unfortunate incident, some unseen force seemed to have grabbed the neck of this unfortunate employee and slammed her head down on the table! The most haunted area, however, seems to be the bathhouses, located on the lower level with guests rooms above it. Stall doors would unlock and fly open, this employee would be poked while showering, and footsteps and movement could be heard upstairs, even when no one was staying in the rooms above. It's anyone's guess as to who or what is responsible for the strange activity experienced in the area, but many believe that the root cause of the paranormal activity could be because of the Native American influence of the area, especially the disturbance of a burial ground.